We had a small dinner party in our Dining room last night. 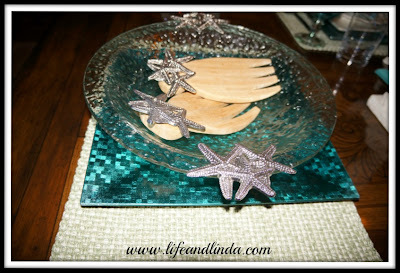 Our friends were invited to our home for a sit down seafood dinner party. We wanted to get together to talk about an upcoming retirement party for both husbands. Sorry, I forgot to take pictures of the food. Thanks for visiting. I hope you enjoy your Sunday. I am also giving away a $50.00 Amazon gift card to celebrate my 2 year blog anniversary. Click here to read the post and enter. 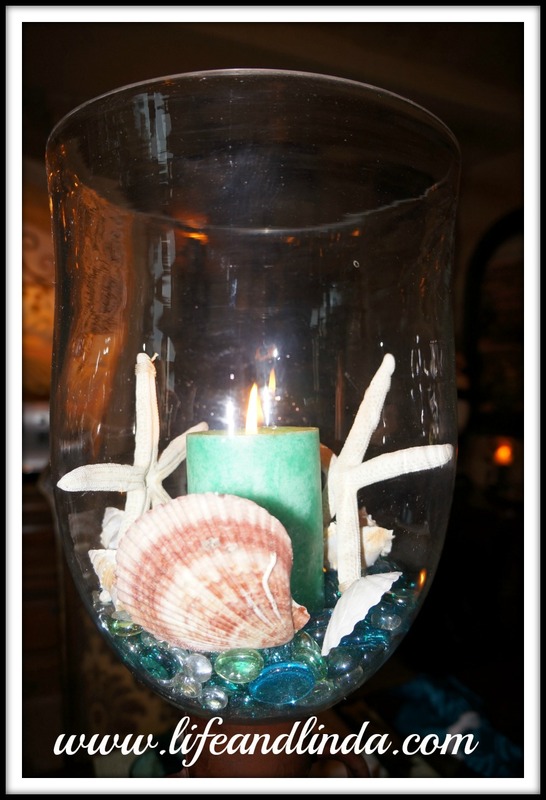 I love seafood and the menu looks incredible but very edible... Lovely decorations. I bet you had a great time. :-) Very pretty. The menu was awesome! Just adore the tablescape....Really love the seahorse candleholders and place card holders...I am sure that everyone truly enjoyed the meal and beautiful table! !...Have a great week!! Linda, how perfect for a seafood dinner! 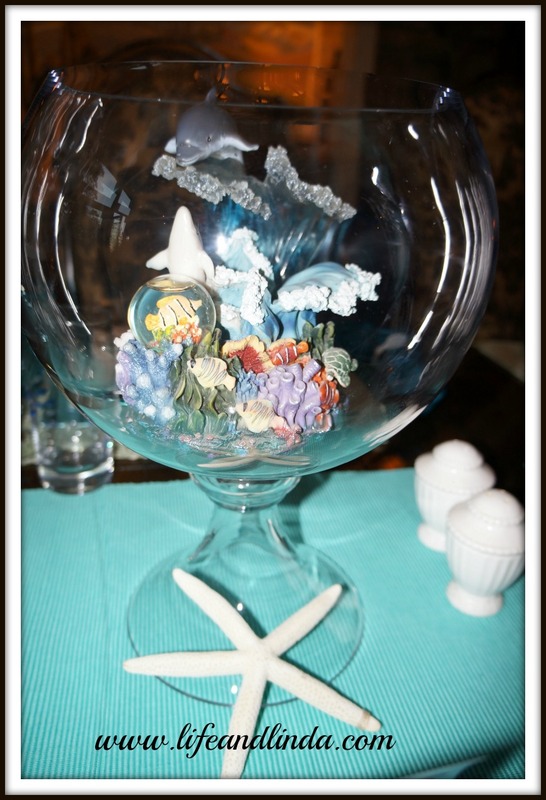 I love all of the sea-inspired accents and that lovely pop of blue! Now your menu sounds delicious! This is just lovely. Each picture showed so many details that you had thought out. 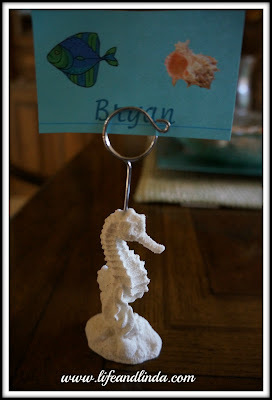 I love the little seahorse name holders. Pretty, pretty colors. Hi Linda! 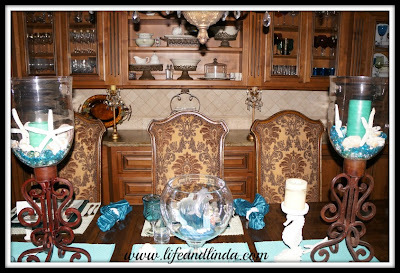 Nice tablescape! 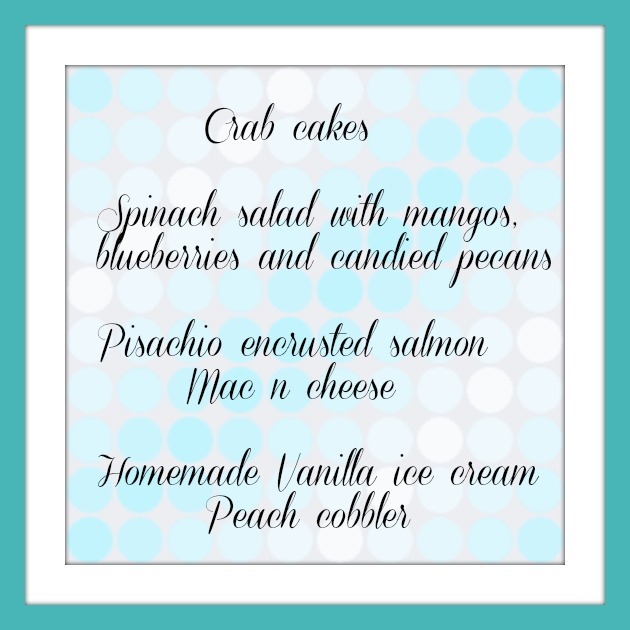 And yummy menu! 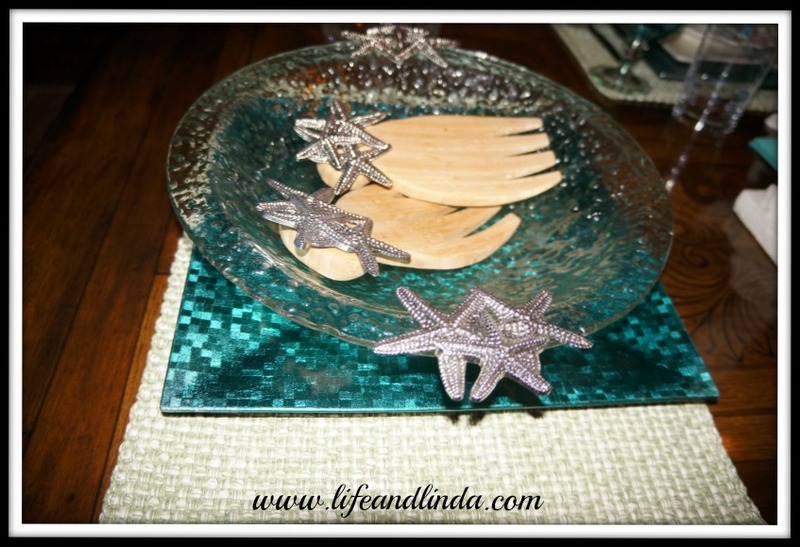 Wow, what a gorgeous summer tablescape!!! :D I adore the pretty turquoise chargers. I know everyone enjoyed the party because the setting was simply stunning! This is such a pretty theme, I love all the decor and seaside themed tableware! The meal sounds great, I may have to borrow the menu. 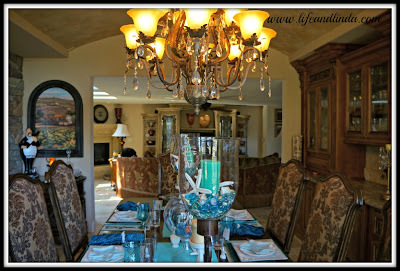 Your table is a vision in Aqua, what a great way to cool off in the California heat. Very creative! I love the seashells clustered with the candle holders and the centerpiece footed bowl with the ocean sculpture! Very cute! 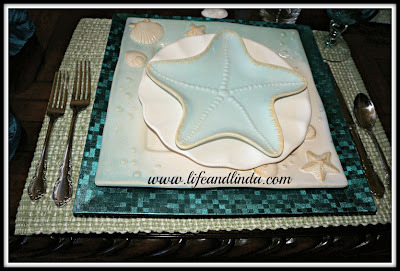 Love the ocean themed plates too! You are a great hostess- you make a lot of effort! 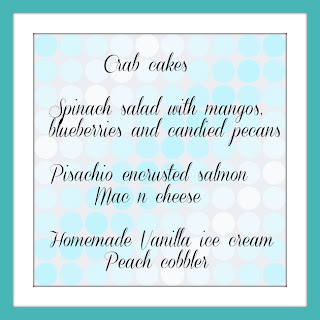 Cute place cards and menus! Beautiful and delicious! What a wonderful treat for your guests. Hi Linda! 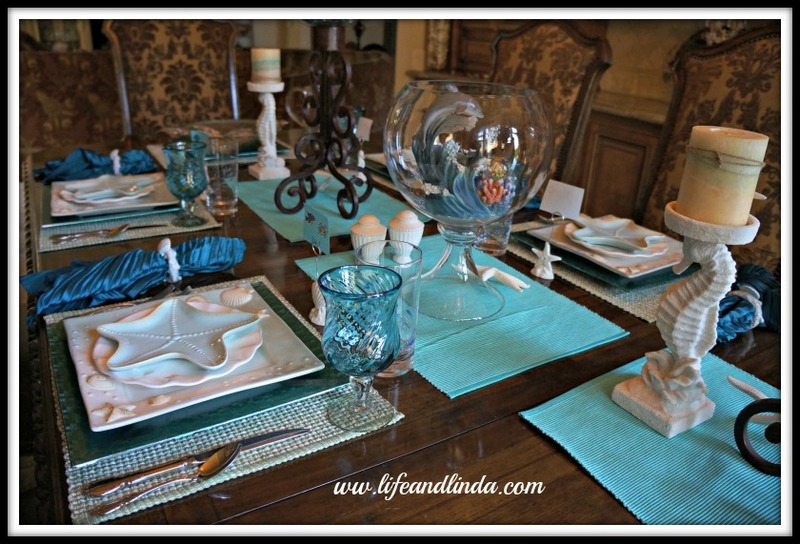 I love this tablescape! The aqua is so beautiful! The seahorse card holders are so cute! Blessings from Bama! Your house is wonderful.I hvae enjoyed all your photos very much. I would like to have been at your dinner party ,the menu has everything i like to eat. Your aqua table setting is wonderful. I am always amazed at how creative you decorate. Oh, stop by when you get a chance. Nel's shower was this weekend, and you can see all the turquoise lovelies. Oh, I am looking forward to seeing all your Fall decor, so I can get some ideas for my own home. 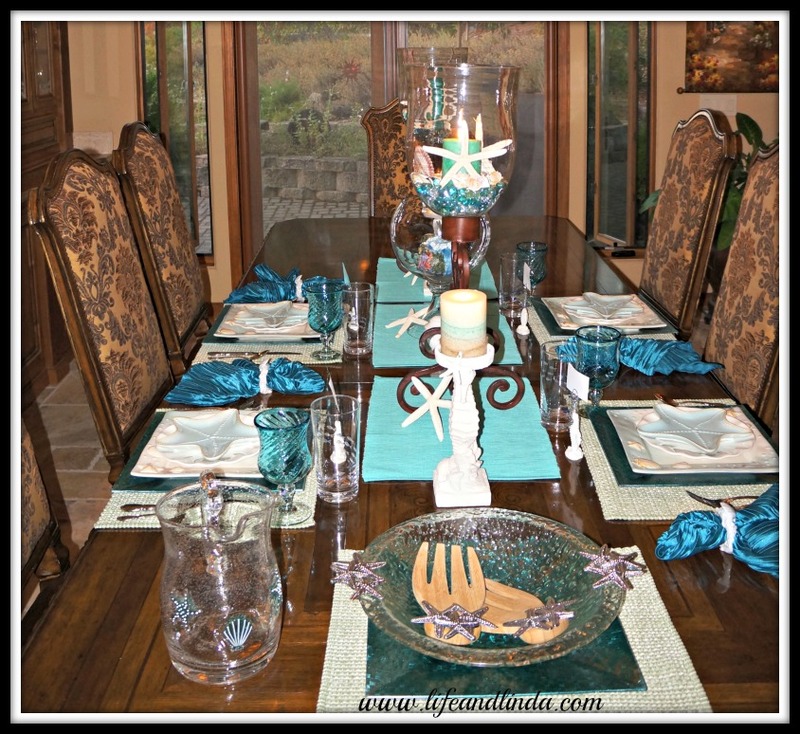 Oooh beautiful tablescape! 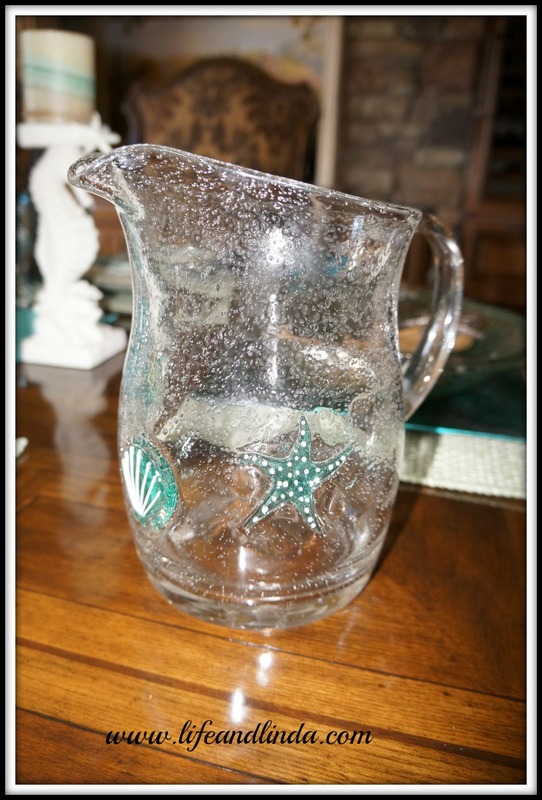 I love all your elegant beachy pieces! 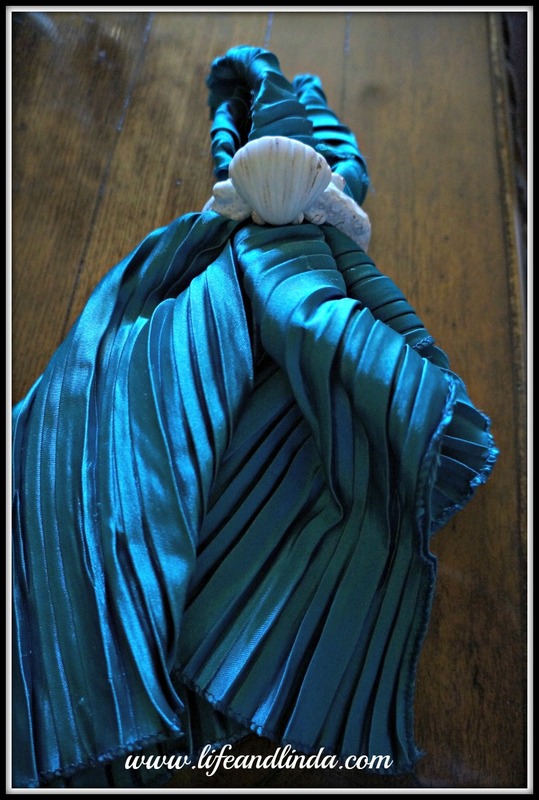 The beautiful turqoise blues against the dark wood looks stunning! Great job. 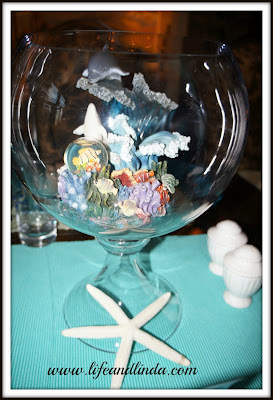 Thanks for linking up to Centerpiece Wednesday! Oh! What a pretty tablescape....I LOVE the teal square plates!! Everything looks just perfect. I am pretty sure that you and I must have collaborated this week!!! Look at the similarities in our posts!!! The theme, the colors...eerie!!! I love the seahorse candle holders and place card holders!!! SO cute!!! 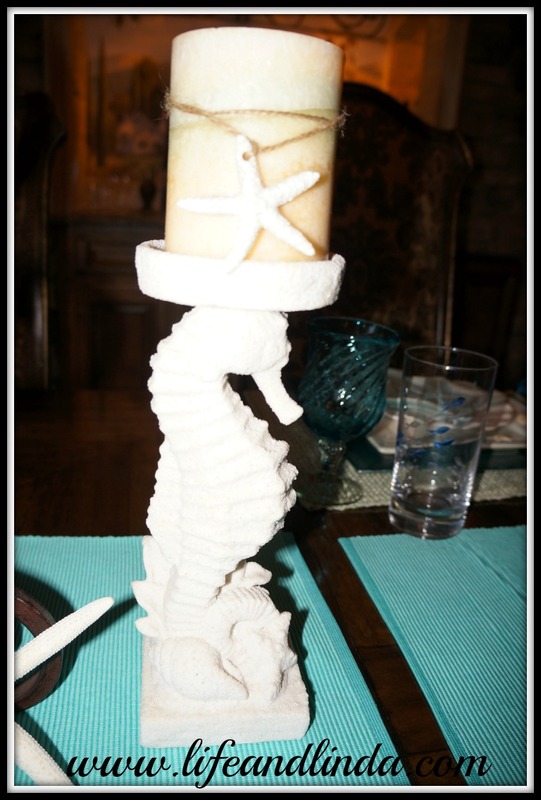 I have white seahorses, but they don't hold anything...they just sit there! :-) Those chargers are SUPER cool!!!! I love the color and pattern!!! 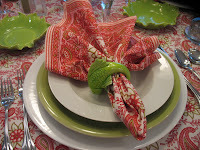 The napkins are gorgeous, too! I love that deep, rich, saturated color!!!! Bravo, Linda! What a "sea-worthy" setting! Love how you really paid attention to detail. Your salad bowl is gorgeous! 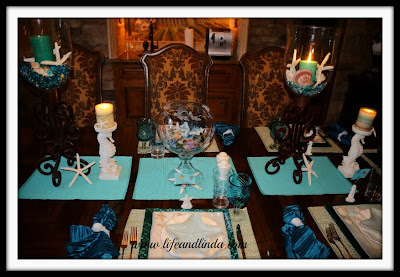 Oh, you know I am loving the beachy theme and all of the beautiful turquoise touches! You really made your dinner special! 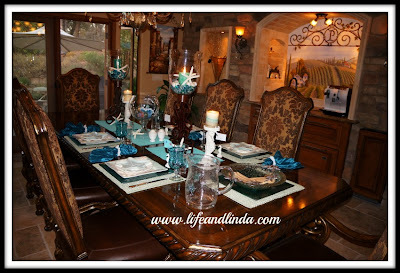 Aqua is my favorite color to do tablescapes...just beautiful, Linda. I ♥♥♥ the stemware. 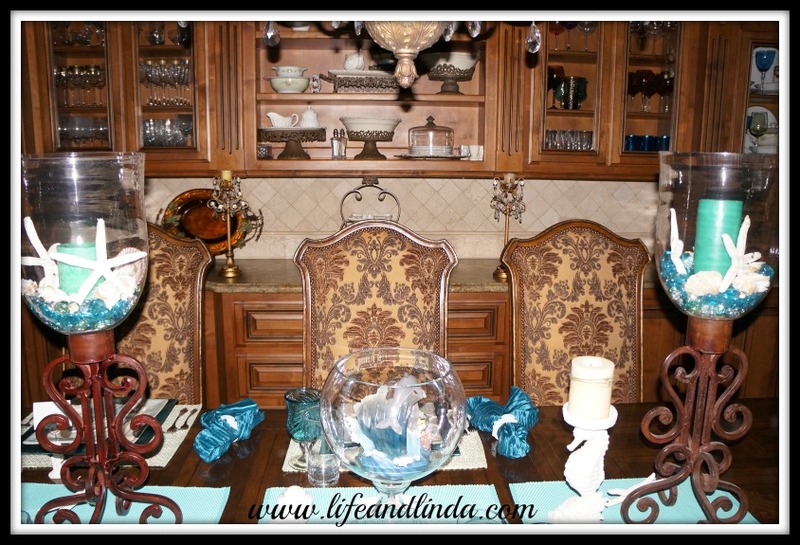 Your tablescapes always make me smile. The Aqua pops with your gorgeous dining room. 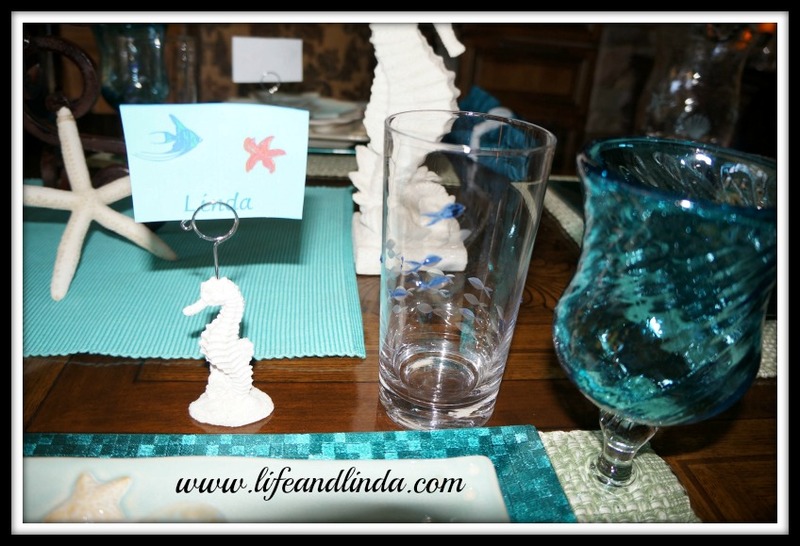 Your tablescape is just simply gorgeous, as always, Linda!Love Your Centerpiece, china, stemware, napkins, And what a lovely theme and Aqua color scheme, too. And since I've been on a blog break, I've been peeking at all the tablescapes settings and they are all so beautiful, too! You are so talented and are such an inspiration! I hope you and your family are having a wonderful weekend. 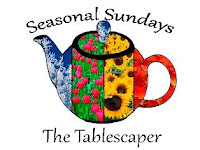 I will be posting a new tablescape on this Sunday. Linda thanks for sharing your beautiful tablescape. The aqua colors are so refreshing for the end of a hot summer. Thanks for sharing with SYC. That is lovely! The salad bowl is stunning! What a beautiful table setting! !